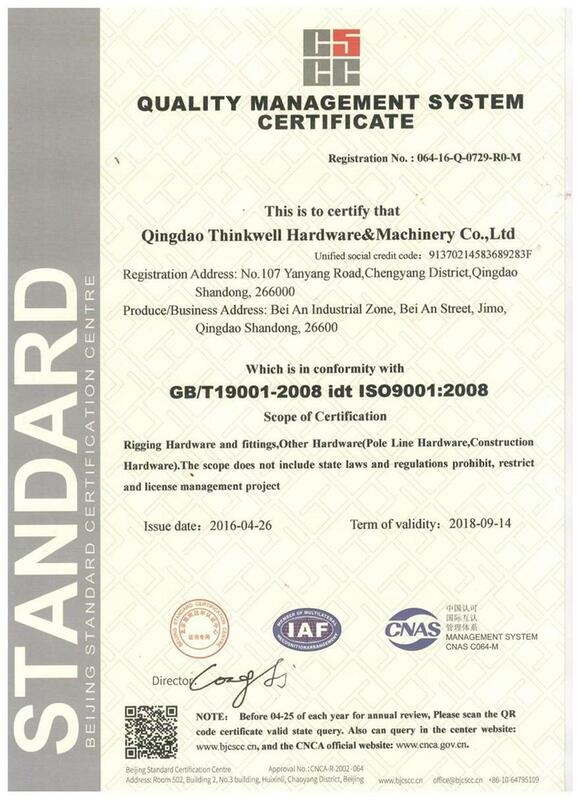 Qingdao Thinkwell Hardware&Machinery Co.,ltd is a leading supplier in the lifting industry,including rigging hardware,pole line hardware,trailer towing part,marine hardware,etc. We strive to providing high standard quality products and 24-hour online service to global customers. The THINKWELL was born in 2002, the first successes started when it as a forging factory only , supplying hooks,shackles,etc. The revolution of THINKWELL has been started since 2011,which changed to be an Integrated companies, have a right to operate import and export trading business by themself. Till now, our factory covers an area of 10000 square meters.It has 3 work shops, 1000T/630T/400T/300T/160t friction forging machines, rolling machines,blasting equipment, and the most advanced electric screw presses . Working staff is more than 160, included 10 professional technicals and 4 QC,10 international sales consultants,we served for the global marktes ,where is customers' demonds. THINKWELL, leading the fine way .Welcome to THINKWELL. rigging hardware and fittings, other hardware(pole line hardware,construction hardware) The scope doen not include state laws and regulations prohibit,restrict and license management projects.